It’s time for an edition of fun things Friday!! We all know Friday is pretty much the best day of the week so I like to celebrate with showing some “fun” things I’ve seen or done this week. On Tuesday I went to Target to get the new Star Wars movie on DVD for Marty so naturally I did some browsing of my own. Usually at Target I really shouldn’t be permitted to shop without adult supervision, but don’t worry, I practiced more self control this time. How cute are the strawberries and the ice cream cones?! These were just adorable. How sweet are these little critters and flamingos? Also Target had these insulated water bottle things?? Not real sure what they are, but they were cute so…. I also picked up a new sign for our front door. I don’t think that I will really use it until July, August and September which means I’m still on the hunt for the beginning summer months. Still though! I went running in an old spot that I used to run on Tuesday and I actually ended up doing something that I’ve been wanting to try. I ran a whole 4 miles! 4! Let that sink in. F O U R. How cool am I?!?! I’ve never done that. I’m so excited and proud of myself. Not that I want to run 4 miles all the time; I just wanted to see if I could do it. Finally, we had this old bed that finally got done being re-stained. I picked it up on Wednesday and drum roll please…….VitaTops will rock your socks! They taste the magic. Saturday night I made homemade pizza (I didn’t make the crust this time.) This was my pizza (M would’ve thrown a fit if I made him eat my turkey pepperoni and “weird cheese” pizza.) FUN FACT: I actually neverrrrr put pepperoni on my pizza at home, but that day, I just sorta went for it. Pizza is a MAJOR fear food for me, so even when I eat it at home it’s kind of an epic thing. One day I’ll eat real pizza…one day. I’m actually considering making a whole “fear foods” list. But we’ll see how that goes. It just seemed like a good opportunity to take a selfie in my poncho, my Grandma’s owl whistle necklace and heart sunglasses (I ❤ these!!) The sun was shining and it just seemed perfect. And sometimes, you just have to take a selfie, right??? Then, I went for a run at my house. I was a little concerned that it was going to be too cool outside to run but M reassured me over and over that it was going to be fine. Actually, his exact words were “well are you going to be walking the whole time? Then, you’ll get warm. You’re running.” I’m such a baby with cold so I still wore this big long sleeved shirt. While I was on this run at my house, (I run on our paved road so it’s pretty nice) I met these 2 dogs!! They have never joined me on a run before..haha. They were so random!! Thank goodness they were super sweet though!! And then other times, you just have to run with sheep, right?! Those sheep basically live with us because our house is just basically in a pasture and these sheep are constantly there. So anytime I run actually, I’m always running with some kind of animal. Getting my wildlife fix. One of my goals in this journey is to try and eat actual dinner (lunch….now that’s a stretch and freaks me out.) But dinner seems doable because well, I’ve gotta fed my husband. On that note, tonight I’m going to try making this homemade macaroni. So, we’ll see how that turns out!!! So, this is what I get, y’all. This is what I get for trying to be healthy and trying to get better. I get bruises that cover my entire knee on both my legs, cuts on my wrists, this bruise/scrape all down my right arm and then finally, a huge scrape/gash on my right knee. 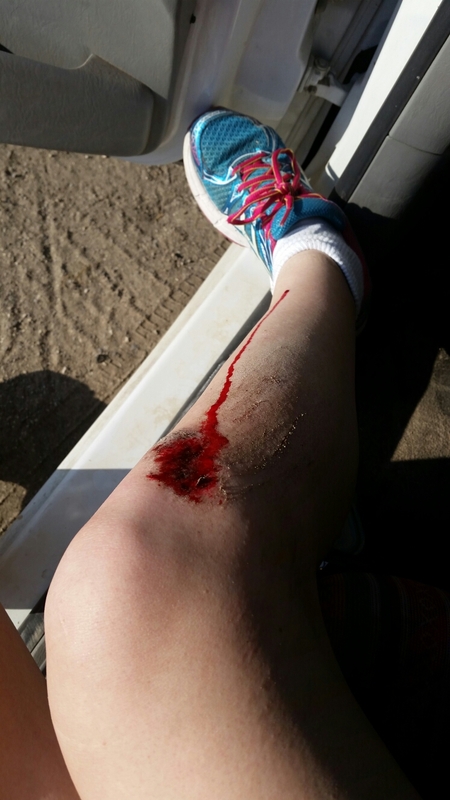 Needless to say, I’m unfortunately pretty dang clumsy. I mean, seriously, one second I was running along minding my own business, and the next second I was on the ground!! (I was running in a very public place by the way, so I’m sure somebody got a good laugh out of my fall.) This is like a major flashback from the summer of 2013. Normal people might consider this a bit of a blessing. It would give them a chance to recover, get back to normal with health, and just take an overall breather from their hectic/rigorous/time consuming workout. Wellllll, if only I could relate to that or say it was me. I didn’t fully finish my run today because I fell, and that’s been driving me absolutely nuts all day, not to mention I have to figure out a way to actually do workouts now. Because I’m totally positive actual running is completely out of the question seeing as how it’s kinda hard to walk. So now, I’m faced with another challenge to add to my plate. With my eating disorder, I’ve made working out a part of my daily routine. I have to do it and I usually don’t have a choice. Truthfully, I’m obsessed. Not on purpose though, don’t get confused there. Now I have to figure out some way to do it. I think I might go crazy if I can’t. 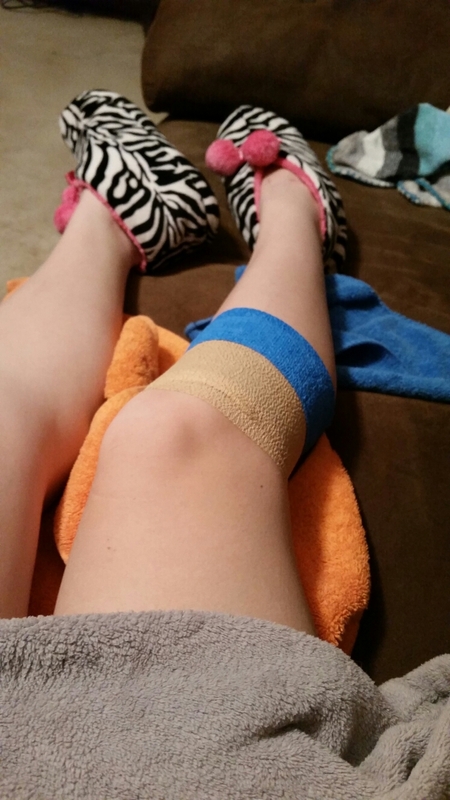 I don’t see how bending my knee is going to be easy, but I’m so crazy….that I’m gonna try to find some way to do it. I feel like if I don’t, that leads to even more restricted eating, even more fear, and that ultimately leads to even more deteriorated mental health. I can’t do that! I can’t live like that! It’s not living. I’m already kind of maxed out on stress in that department. With the stress I’ve already created for myself in that department over the years, the extra stress from my upcoming nuptials, and anxiety from the student teaching adventure I’m about to embark on, I really don’t need this added on to it. I feel like all the time that people don’t take me seriously or they don’t think I’m “sick” because I’m not skin and bones and I actually make myself eat some food (even though it may not be sufficient.) 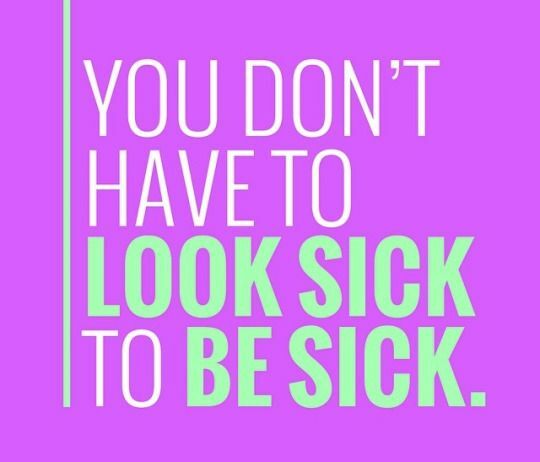 The truth is though….I am sick. Sometimes I think maybe sicker in some ways than I was before. Sometimes I think it’s worse than it was in 2013 or when I first went to therapy. I’m just not totally positive. 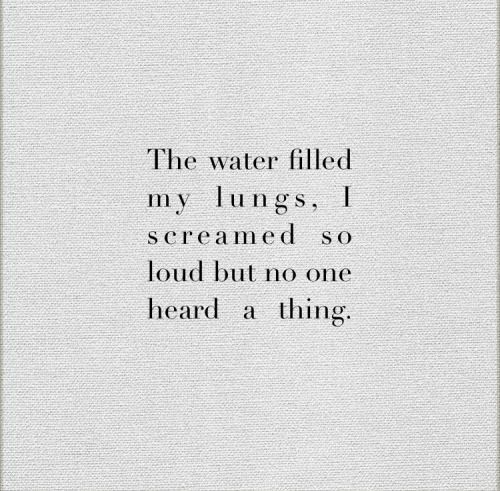 Sometimes I just feel like I’m screaming at the top of my lungs and nobody hears me. But what are they even going to do anymore? I don’t really want to hear anyone say to me “just eat” or “it’s going to be okay”. I think maybe, I want them to feel it?